Hi From what I know about Pvt Ham, he was the first New Zealander to die of wounds sustained in action during WW1. He is buried in the War Cemetery in Ismailia, Egypt. Could someone relate a little about the action in which he got wounded and what these were? William Arthur Ham, Canterbury Regiment, died on the 5th of February 1915. The first action that New Zealanders were in in WWI where casualties were sustained was the Suez campaign where they were fighting the Turks on Egyptian soil in February 1915. Thanks for the info Dave; I had seen the Auckland Museum site before, but have little knowledge of the action. His name is listed on the local war memorial to me. This is in Ngatimoti. In some places he's listed as being from Motueka, but is from Pokororo or Ngatimoti; I'm not sure exactly where; both are a stone's throw from each other. The reference to Motueka is possibly the place where he went to fill in his recruitment papers. Or the closest post office to where he lived maybe? Are those mortars on the corners of that Cenotaph? Most likely; there was and still is no post office at Ngatimoti, although a store was opened in 1941 and has since closed. Both are pretty isolated; the nearest store is in either Mot or Upper Moutere, both of which are around 20 mins drive away. Ngatimoti has a WW2 memorial hall, a school and a volunteer fire department, but that's it. I think Pokororo has a very small hall. The latter is on the west bank of the Motueka River from Ngatimoti. Yep; looks like minenwerfers to me...! William Arthur Ham was my Great Uncle. 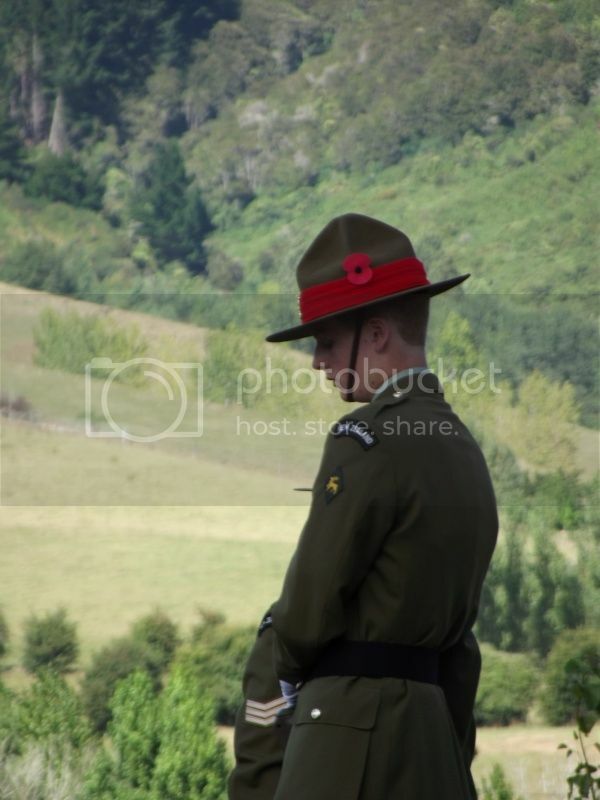 I have grown up with the understanding that he was the first NZer killed in action in WW1. I represented my family at the National Army Museum when the recognised Willy. www.army.mil.nz/at-a-glance/news/army-news/archived-issues/2009/395/fffnam.htm This was a really special occasion, as my Grandmother noted: www.odt.co.nz/your-town/dunedin/41773/first-casualty-be-honoured Although according to the Auckland War Memorial Database he was killed on the 5th? Hi Ashleyrayna; I take it you are a local too? The links Dave and others have provided here are very informative and I've learned a bit about him from them. I read in the local newsletter that the minenwerfers are going to be repainted and given a bit of TLC in situ by a local chap. 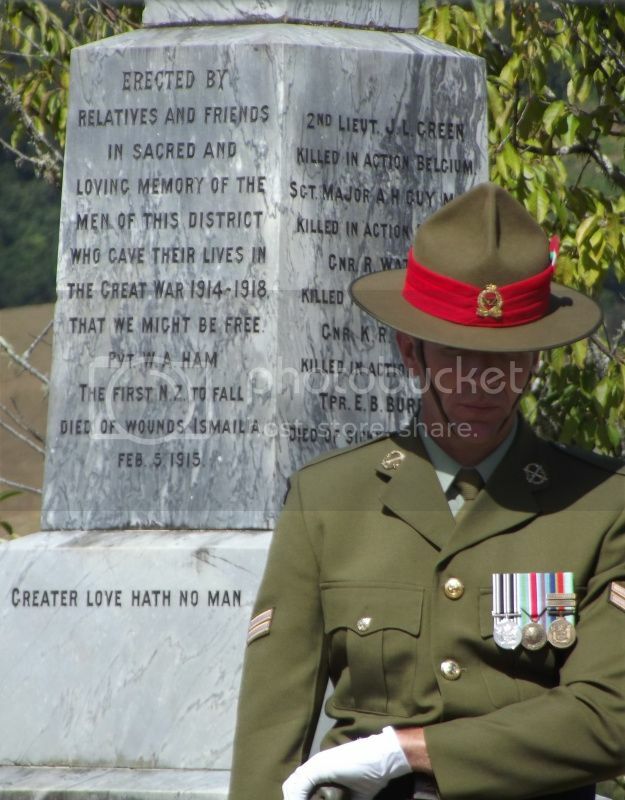 It's a while since you posted this query, but if you're still interested, a comprehensive account from a local perspective of the action in which Pvt William Ham was killed was written by Cyprian Bridge Brereton, also from Ngatimoti. Then Major Brereton, he was company commander of the 12th (Nelson) Company, Canterbury Infantry Battalion, of the 1st New Zealand Expeditionary Force. It's recorded in his book "Tales of Three Campaigns", a history of the 12th (Nelson) Company which covers the formation of the NZEF and the early war experience of the company defending the Suez canal from attack by the Turks, the campaign on Gallipoli, and the activities of the company as part of the New Zealand Division in France and Flanders including the Somme. There are several photos with this article, including this one of Pvt. William Ham taken before he embarked at Port Motueka for Nelson, and then on to training camps first at Christchurch and then Wellington before heading off to Egypt. 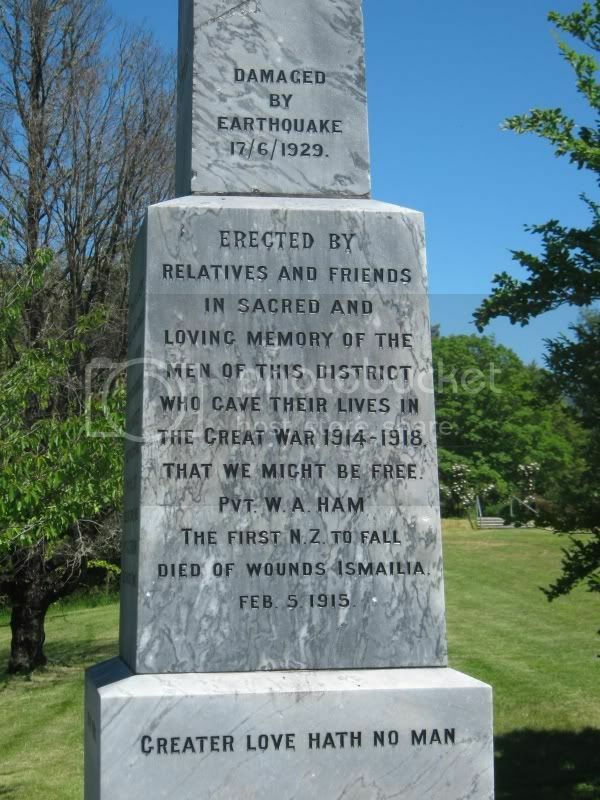 Although William Ham died on the evening of the 5th February, 1915, he was in fact mortally wounded during action on the afternoon of the 3rd, and was cared for at Ismailia Hospital till his death. 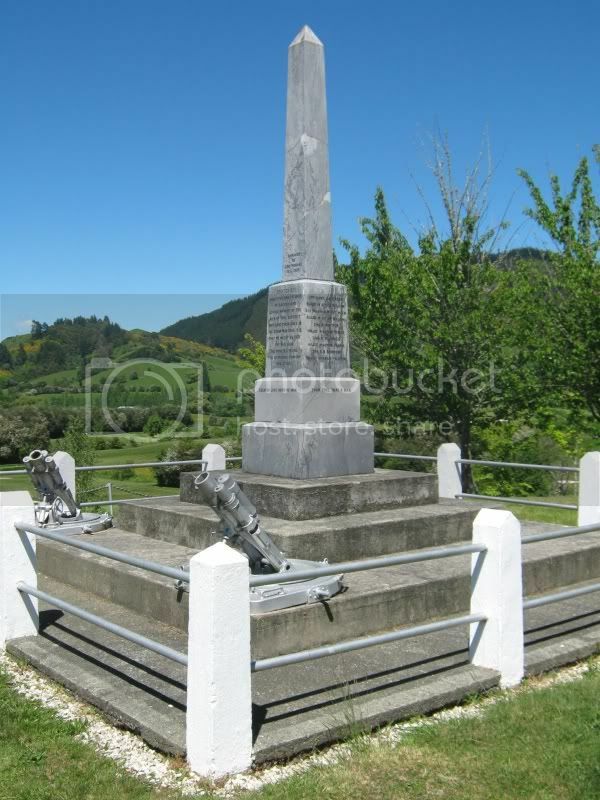 William Ham worked as a farm labourer in the Ngatimoti area, and C.B. 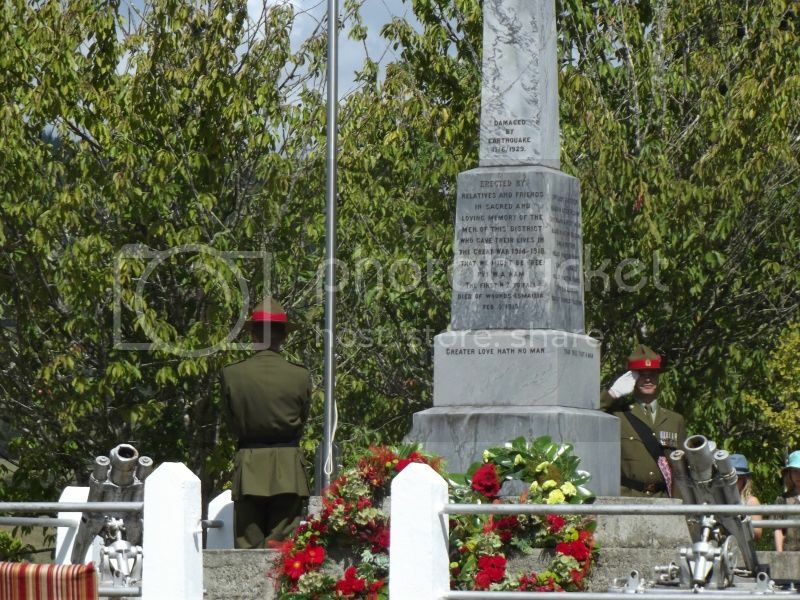 (Pat) Beatson commented in his memoirs “The River, Stump and Raspberry Garden: Ngatimoti as I Remember": "The war memorial reminds me particularly of Willie Ham, who used to work with Dad before the war. 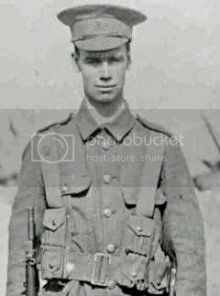 He was the first New Zealander to be killed in World War I - killed in an engagement on the Suez Canal when the Turks tried to seize possession of the Canal in 1915"
The Beatsons had property just over the Peninsula Bridge on the Pokororo side (this land is still in the hands of the Beatson family today). 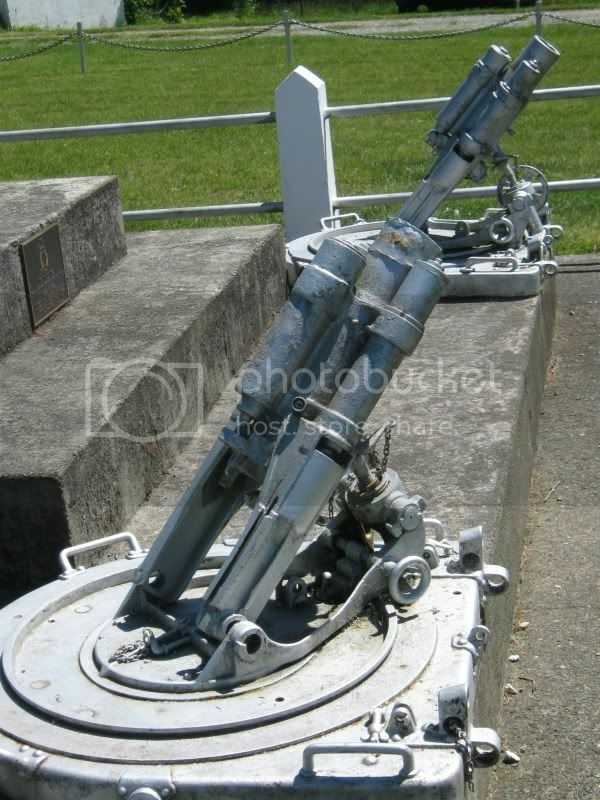 Re the mortars at the Ngatimoti memorial - yes, they are a pair of World War 1 vintage trench mortars given by the Defence Department when the memorial was built in 1921, at the request of Lt. Col. Cyprian Brereton, the Motueka Valley’s highest ranking military officer at the time and author of the book mentioned above. Among the names of the dead inscribed on the memorial are those of his brothers-in-law, Hector and Walter Guy. PS Ngatimoti did in fact once have a post office. Opened in 1870, It was originally located at various private homes. When John A. Guy (later C.B. Brereton's father-in-law) became postmaster in 1892 a single Government telephone line was connected to his home. Telephones weren't available in private homes till the 1920s, when some residents put in private lines. 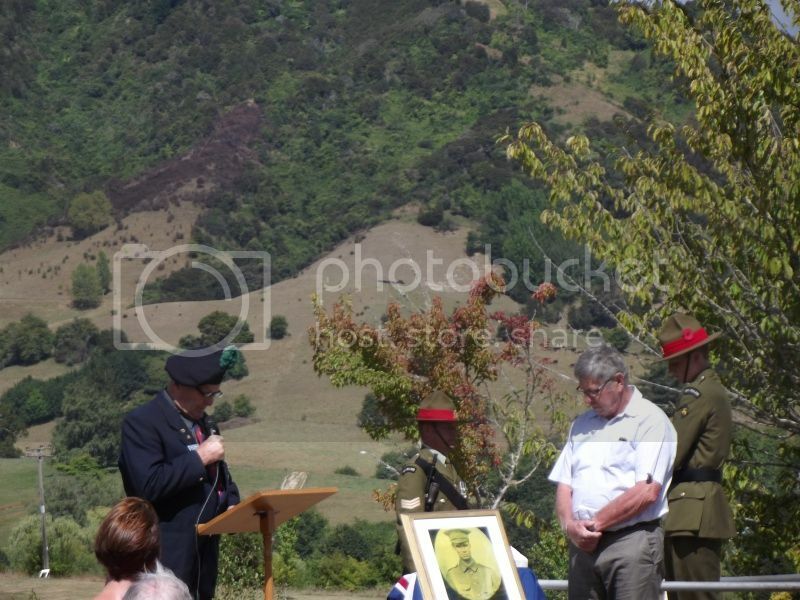 (In fact, because there were no private phones in1914, John Guy was the first to receive offical confirmation of the expected news that England and Germany were at war and notified the people of the Ngatimoti area by ringing the St James Church bell). The Ngatimoti Post Office remained at the Guys' till the early '20s when it became part of the old shop which can still be seen on Waiwhero Road near the Ngatimoti Memorial Hall. A telephone exchange was opened there in 1948. The Post Office closed in 1978. (See Kath Beatson's book The River Flows On for more information about the various historical services which operated in the area). I attended the service. A copy of the photo talked about in the Nelson Mail article was presented to the People of the district by the Nelson Museum. I'll post photos later. 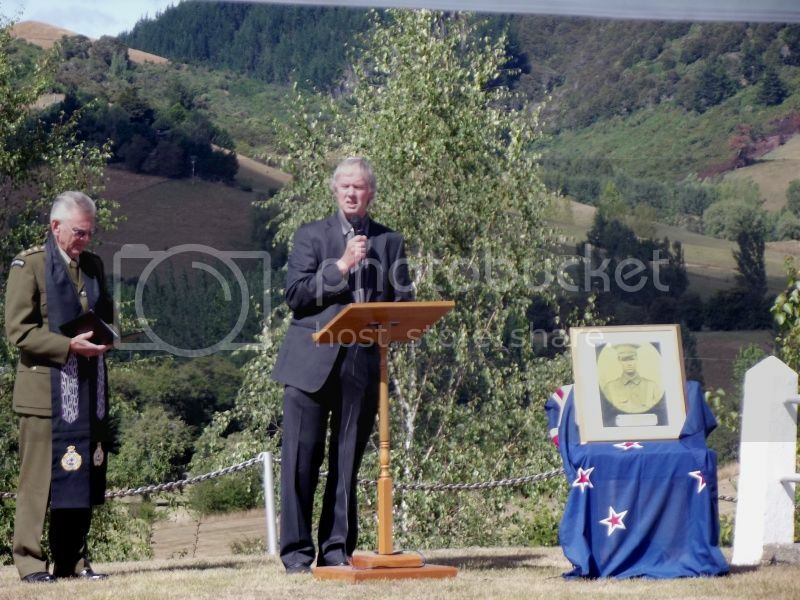 The local padre of St James Chapel, Ngatimoti gives a eulogy at the commencement of the service. A very youthful honour guard. The Deputy Chief has a word. 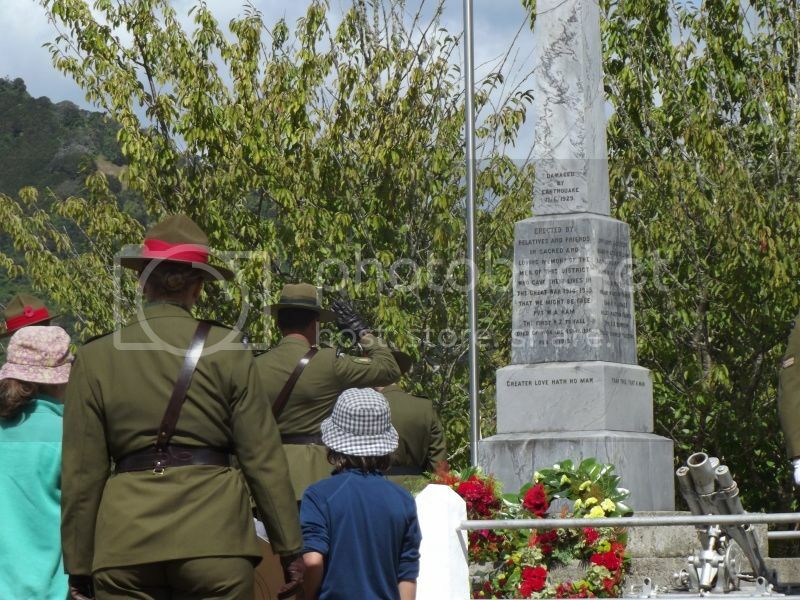 The presentation of wreaths; the children laid a wreath on behalf of the 100 students of Ngatimoti School. 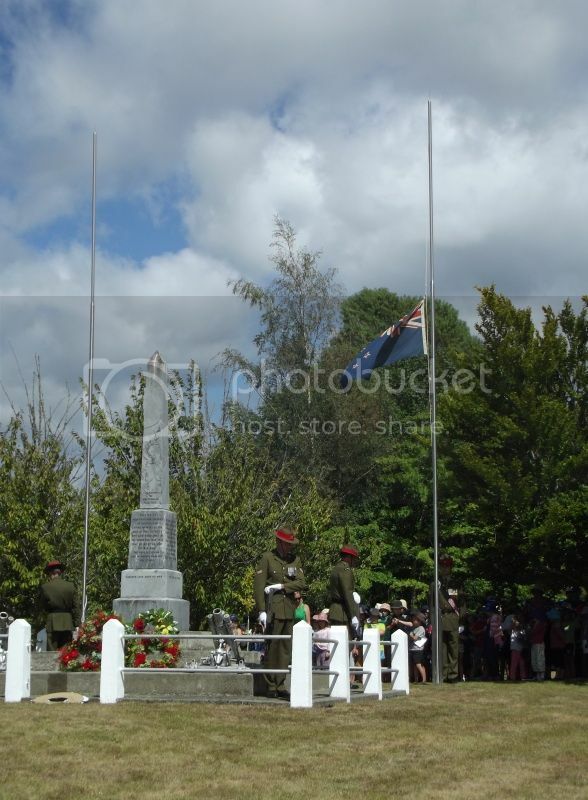 The Last Post and the NZ ensign at half mast. 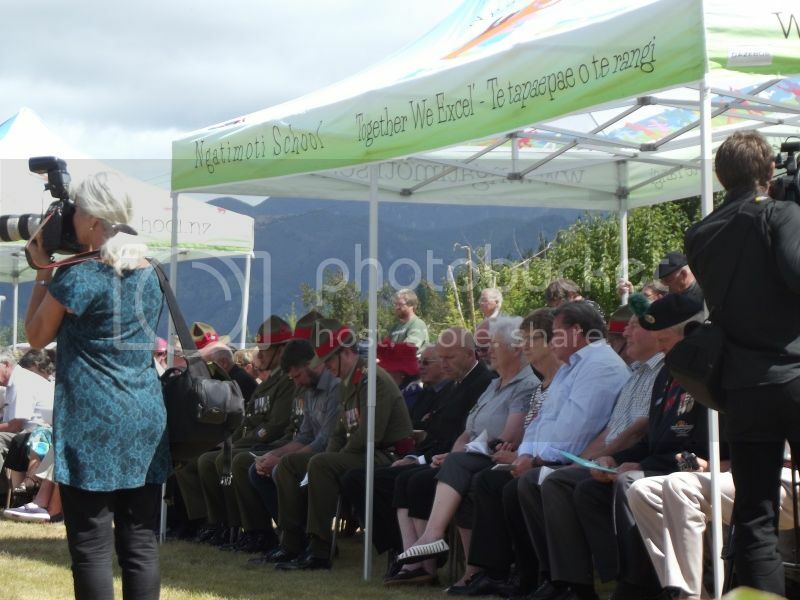 The entire Ngatimoti School was present under the tree in the background. My daughter is in there somewhere. More presentations. 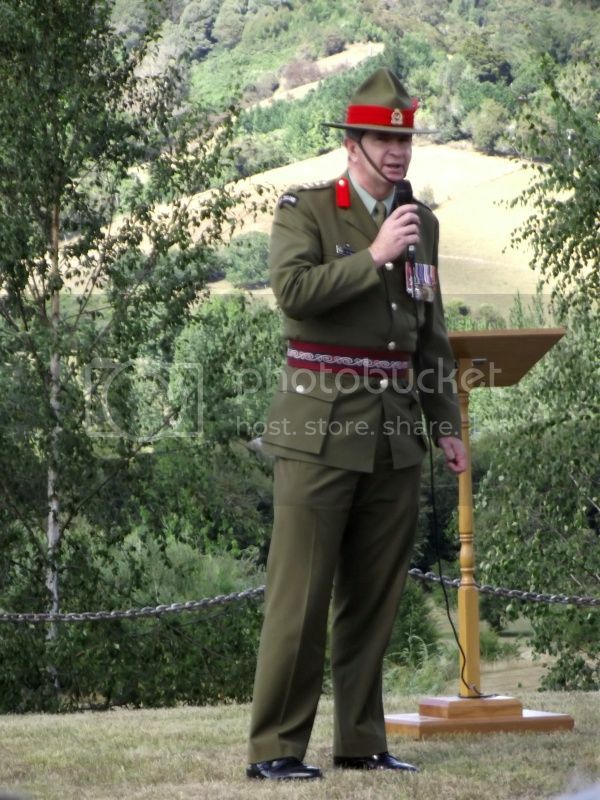 The chap speaking was former C/O of the Nelson Regiment (Battalion? Not sure of the details). Dignitries under a brightly decorative gazebo courtesy of the school. The bald chap at centre in the dark suit is Chris Ham, who is a surviving relative. Chris works for Safe Air and came over for the day with Cliff Brereton, whose family is also from the local area. A relative of his was Willie Ham's C/O. Both Cliff and Chris work in the Iroquois Section at Woodbourne. Couldn't decide whether this image looked better in colour or black and white. Sadly, I'm moving from the region in the next few weeks and will miss it very much. Events like this make the Motueka Valley a very close knit community and I'm very proud to have been let into the locals' inner circle. Thanks for these photos. When you say Deputy Chief, I am sure that is Jon Broadley of Cambridge. He's head of the Territorial Force. Yes, that's it, I remember the name, I thought he might have been deputy chief of the defence force or something. I didn't quite get his rank or title, but I do remember the name John Broadley. Good speaker. Jon's a Lieutenant Colonel. I know him from here in Cambridge, he and I served on the Armistice in Cambridge committee, he's still on it I think. I'm not. A very good bloke. And yes, a great speaker. 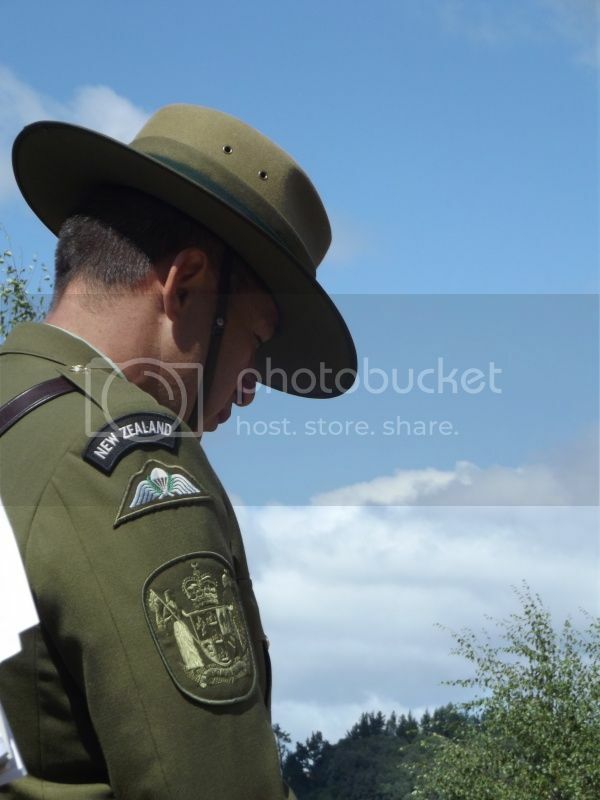 William Ham also featured during this year's large Anzac commemorations at Ngatimoti, and again members of his family attended which was great to see. In the time since i last posted here I have written an article about William Ham for Top of th South history website, the Prow, in which I've included links to various accounts of the battle and William's death for those who'd like to follow them up. Of possible interest too is news that Lt-Colonel Brereton's memoir about his time with the 12th (Nelson) Coy.- "Tales of Three Campaigns"- has been reissued in a beautifully produced and expanded edition including further materiall from C.B. Brereton's unpublished work and photographs from his personal collection.